Bill Hardesty’s resilience has brought him and his crew of Taylor Canfield, Stephanie Roble and Marcus Eagan to the top of the leader board despite a heavy downpour and flukey winds on the third day of the 2014 Etchells Worlds, hosted by the New York Yacht Club at Harbour Court in association with Sail Newport. 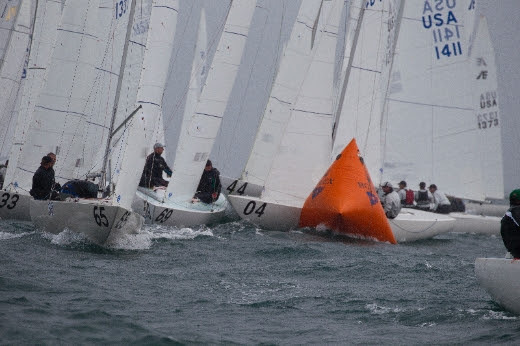 After a two-hour postponement on shore followed by another two hours on the water, storm clouds gathered, the wind velocity increased and the wind direction settled down enough to allow Race 5 to start. Shortly after that, the rain began, so forceful at times the weather mark was obscured. Those who sailed to the right, toward the squall, faired better and rounded the weather mark in the lead, albeit a bit wetter for their efforts. The wind shifted left throughout the race dropping slightly in velocity. Senet Bischoff and Ben Kinney won Race 5 by a healthy margin with Hardesty finishing fourth, giving him a 9-point lead over Hank Lammens, who finished 16th in today’s race. Marvin Beckman sits in third overall followed by John Bertrand in fourth and Ante Razmilovic rounding out the top 5. Tomorrow’s start time has by moved up one hour tomorrow to maximise what is expected to be a dying northerly breeze. After six races have been completed, each team will be able to discard their worst finish.